The Niagara Antler Chandeliers feature three tiers and 15-18 lights to illuminate your cabin, foyer or dining room. The graceful bends and curves of natural antlers complements everyone's rustic decor. Internally wired with attention to detail that includes antlers being used to form the holders and drip dishes for the light sockets. 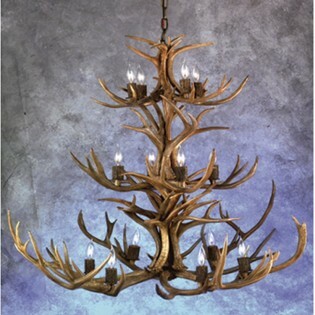 The Niagara Antler Chandeliers feature three tiers and 15-18 lights to illuminate your cabin, foyer or dining room. The graceful bends and curves of natural antlers complements everyone's rustic decor. Internally wired with attention to detail that includes antlers being used to form the holders and drip dishes for the light sockets. Please allow 2-4 weeks for delivery.